There are two ways to treat a laid off employee – there is a nice way and an evil way. There are circumstances when a combination of bad company practices, bad managers, politics, organization restructuring, profit goals and other factors play a role in laying off well deserving good employees. But there are also cases where companies are compelled to downsize as a consequence of economic recession, retrenchment, low company turnovers and even global political moves, with very little relevance to employee competence. Layoff is often an unfortunate possibility that many workers fear as any of the above reasons start creeping into the business community. Most companies feel that letting go of their staff, is not an easy task, summoning employees to the conference room and telling them that their livelihood has just been taken away. Not only does it exude a level of harshness, that a lot of managers are not comfortable with, it is also not practically useful to the companies to downsize without a plan. It is not only humane but in a company’s best interest to help out the workers that they will have to layoff. Outplacement Services are a way to cushion the blow of being axed as part of a business decision. Organizations often use them as a means to provide career, and financial, assistance to the ones who have-been or will-soon-be laid off, or terminated. In this article we will talk about the best practices of Outplacement Services that companies can provide to increase their goodwill score. But before we list out the services, let us explore the reasons behind this gesture. It reduces the level of bitterness among the outgoing employees thereby reducing the chances of liability issues. It is never a good practice to burn bridges. It is not uncommon to see companies recall their former employees. Take the example of General Motors, Ford Motor, Dell, AK Steel and others who reached out to formerly laid off employees when the business conditions, post recession, improved enough to prompt them to hire back the once trained workers. It is never a sign of a morale boost to see your coworker being unceremoniously axed out of the organization. It creates an unsettling feeling of what if I am next among the surviving employees, taking away their willingness to stick around for the axe to drop on them. It improves company image. It indicates their willingness to do whatever they can to help the future of their former employees, in spite of their inability to keep them employed. And finally it is the right thing to do, next to not taking away their job at all. 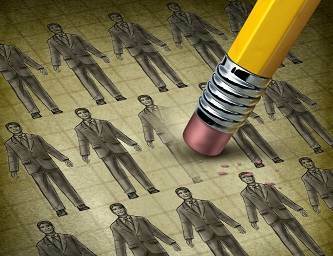 So what are the services that companies can provide to reduce the burden of a loss of job? The first and the most noble thing to do, given the situation, is to provide employees enough time to recuperate from the initial shock of getting a pink slip, and then moving on to find another alternative, within reasonable time. For instance, The Worker Adjustment and Retraining Notification Act (WARN Act), in the US, provides protection to workers by requiring employers to give a 60 day notice in certain cases. There are situations where there is no legal binding as to when employees are exposed to the harsh upcoming scare, but in general it is a good practice to provide a fair warning and enough time off, with pay, to let them search for jobs, attend interviews and basically prepare themselves for survival. Severance Packages provide a source of money to an otherwise sudden loss of means of living. They say that you can’t buy loyalty, but you can certainly put a price for being made to leave, your job, after spending years in an organization. In India, according to the Payment Gratuity Act of 1972, an employee is entitled to 15 days pay, for each year they have worked, for termination of his job after five years, which basically comes down to about 1 buck per bead of working sweat, 10 bucks for each of your boss’s yelling and 20 bucks for all the sleepless nights. Besides the salary fraction, you are also entitled to your bonus and deferred compensation payouts, your pension, your restricted stock, your unreimbursed business expenses and the stationeries you have stacked up on your desk. Big companies usually have multiple branches and divisions with sometimes overlapping required-skill- sets. It is often possible for large organizations to transfer their employees within the same organization or an associated entity. The usual clause dictates that the employee transfer is lateral in pay and grade. However, if such an option is unavailable and a lower position becomes vacant, it is still a good practice to inform the employee of his options. Beats the alternative situation of being unemployed. Managers can act on their own network, within the company, to recommend and find an internal edge, relieving employees the trouble of having to compete with outside job applicants. Broadly, this involves either using company or contractually hired resources to provide services like Resume writing, Interview coaching, job search training and even help out with reciprocal job searches through getting employees to network with hiring managers from other companies, currently with open positions. On the same note, companies can also assist in networking with other recruiters, ex-employees, or past and present managers who have migrated to other places. Yet another facility would be to provide training on business updates and skills that may be useful in securing a future job. These goodwill type services help to not only find a job but also to further employee careers, especially for individuals who have worked in a single company, at a single position, for a long duration leaving them at a disadvantage with respect to the current trends. Read Resume Writing Skills and Interview Skills for some insight into what’s hot in the job hunting world. The right thing to do, while getting the employee to sign their severance terms, return of property agreement, non compete agreement, NDA, confidentiality and the release of claims agreement, is to also get them to sit down with a benefits expert who can advise them on how to access their pension and health benefits. For more information, employees are directed to refer to the hair pulling, nail biting read, Labour and Employee Benefits in India. Companies, in any country really, don’t operate in a bubble. There is a legal environment dictated by the labor laws of that country. When employees are terminated, there are certain policies that protect said employees from the thundering jolt of a loss of a job, for a more zor ka jhatka dheere se lage experience. In India, for instance, 36% companies, surveyed by the Right Management Company, have policies governing severance or termination services, as compared to the 23% dictated by National law. Usually it is a combination of both company and national policies that make the package worth a terminated employee’s while. In spite of the non-necessity by way of government policies, nearly 65% companies have provisions for outplacement services. Layoffs, the unpleasant underbelly of corporate culture, is a reality. However a lot of corporations try to make this unpleasantness taste a little less bitter than it has to. Outplacement Services increase the faith and a sense of some kind of security in the face of unpredictability. It makes the difference between creating an environment to not just move on but enhance ones’ career, and in the alternative, creating a persistent fear of survival upon a failure to sustain, as many of Gabbar’s henchmen did. Which kind of company do you think an employee will prefer?